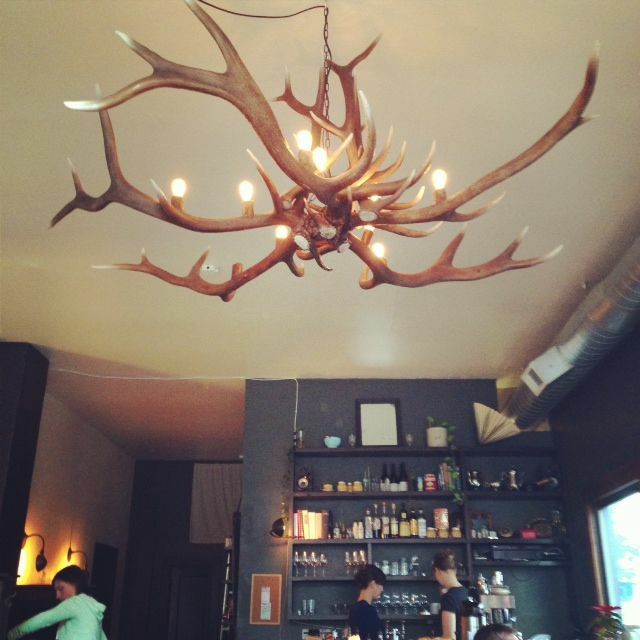 As we entered we were greeted by a very charming space with antlers as a chandelier and dark wood throughout. The space is really small, but very inviting. This used to be home to the Kingdom of Roosevelt, but unfortunately it didn’t make it, so they turned the lease over to Trinket. That should also explain why there are antlers everywhere. I didn’t mind it, and it really is a running theme in Portland now, and I think they pulled it off ok by keeping it. I should note that the other thing we noticed when we first walked in was how stuffy the place was. By that I mean, muggy, warm and windows somewhat steamy. We were there on a Saturday at 10:30. It wasn’t busy and we were able to grab a table right next to the window. She immediately got our tea and house made hot cocoa going. 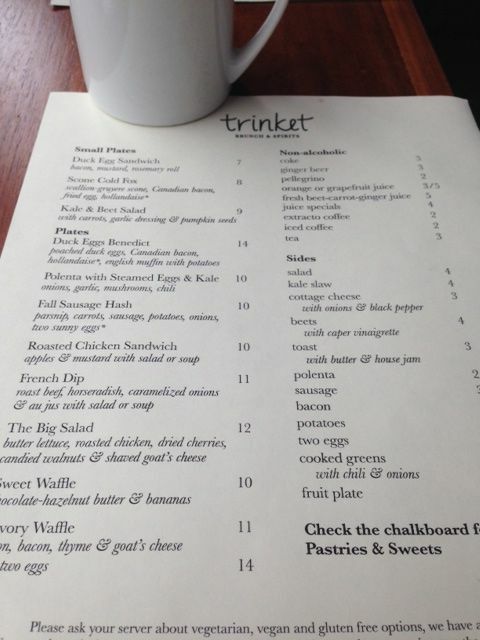 I already knew I wanted the Duck Eggs Benedict and my husband went for the Fall hash. While we waited for our food we also ordered a Pistachio Roll. 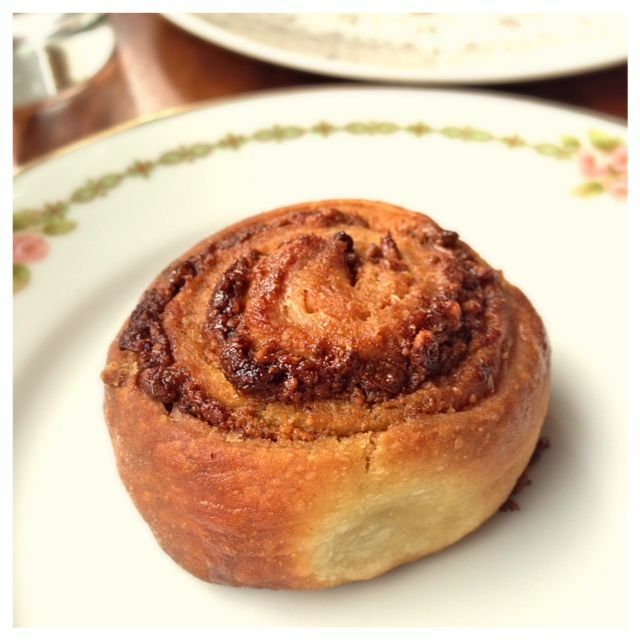 The pistachio roll, at just $2, is a small little guy that packs a lot of flavor. The duck eggs benedict was good. It was a nice sized with a bit of lemon in the hollandaise sauce. I liked the crispy potatoes that came with it too. I did feel like $14 was higher than what I see around town. The fall sausage hash was also good. I do wish it would have had a few more potatoes. 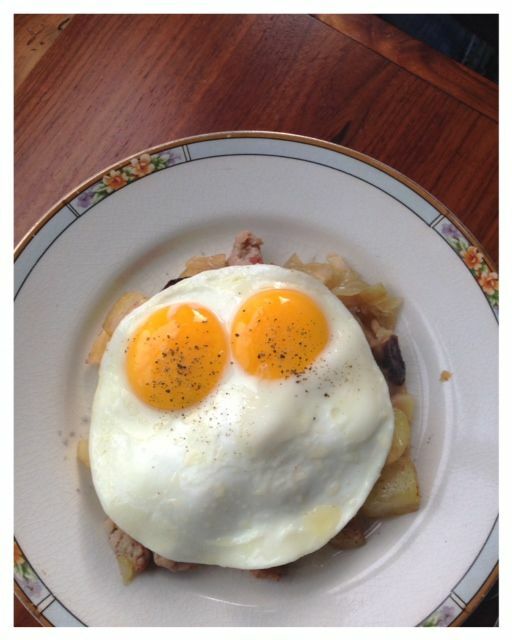 I really do like a hearty hash. The eggs were served sunny side up. I laughed every time I looked at it. It was an expressionless dish. Check another place off my Breakfast list. I’m making progress. Atmosphere was very charming, with dark wood and accents of antlers. 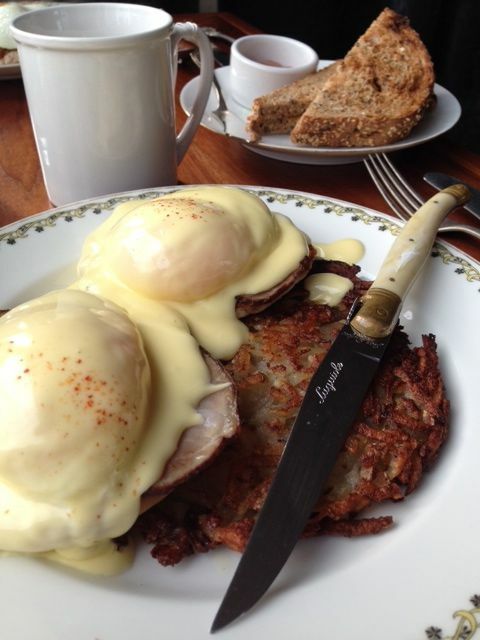 Pricing was $14 for the Eggs Benedict and $10 for the Hash. Service was incredible. She kept things full, answered questions, gave suggestions and was extra pleasant. Drinks were Tazo tea, Extracto coffee, home made hot cocoa and quite a list of fresh vegetable juices. They also had cocktails. Trinket is located on Ceasar Chevaz between Hawthorne and Division. Just a note, I believe duck eggs are more expensive than chicken eggs. At least they are where I live, though duck keeping is much easier in Portland than in Colorado!